There is no doubt that law schools are terrible. While accomplishing your law degree program, one of the biggest hurdles which come in the way of every student is choosing a topic for your dissertation. After having a dissertation topic, you need to write an in-depth dissertation proposal to exchange your idea to your dissertation evaluating committee. 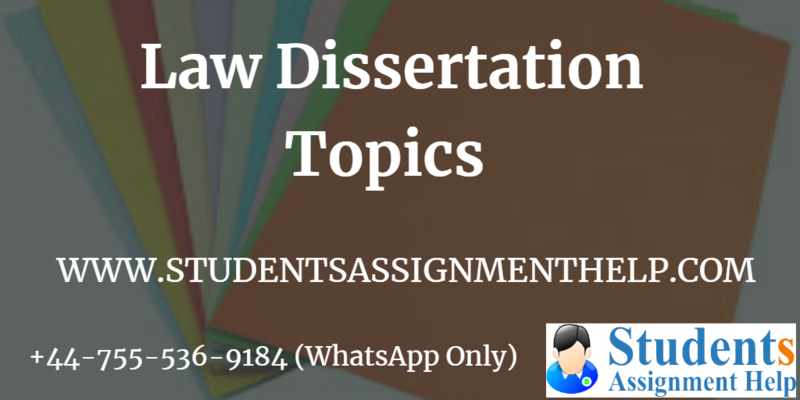 Hence, to help you out with this troublesome task, StudentsAssignmentHelp.com is offering you Law Dissertation Topics help at a very reasonable cost. What difficulties do students face while writing a law dissertation topic? A law dissertation topic has to be suitable according to legal authorities. It is a subject where you cannot put down anything on your own as everything mentioned ask for a proper source. The law dissertation topic should be fascinating to both the writer and the reader. Also, it should adapt to the content of your research. Keeping all this in mind it becomes troublesome for the students to choose an appropriate law dissertation topic. Plaintiff in the criminal justice system: investigation and proof. Problematising public order, state affairs and the threat of groups. Character, capacity and choice conceptions of culpability. Evaluate problems in recognizing the nature, extent, and distribution of crime. Critically examine the international law on the passing of risk. A discussion of European union sale of goods legislation and its place within the UK. Transplantation of corporate legal regimes: Does it encourage better corporate governance? The protection of minority shareholders rights: Remedies to unfair prejudice and premises for bringing proceedings. Critically assess the law on corporate manslaughter. An evaluative interpretation of the regulation of the UK public company. The concept of tort law efficaciously defines what is deemed a legal injury, and practices the circumstances whereby a person may be held liable for another’s damage resulting from either international acts or accidents. A critical analysis of economic loss. Critically analyses the issues of foresee ability and causation concerning the duty to take care. The duty of care owed to children- A step too far? The point of the road for loss of a chance? All the law dissertation topics suggested by our experts are tested in accordance with law, so after discussing with your instructor, you can pick any one of them as your law dissertation topic. If you do not have anyone to talk over or guide you professionally, then also do not worry, we are here to help you. Our professional dissertation writers are always ready to offer you Quality Assignment Help writings. Approach our assignment help experts, and they will guide you through the entire dissertation writing process. Get best assistance from us today. Dissertation writings require an in-depth research and knowledge on its topic. StudentsAssignmentHelp.com offers all its clients the best Dissertation Writing Guide Help at a cheap price. The online dissertation writers in our team are masters and doctoral degree holders from the top universities in New Zealand, USA, UK, Australia, Singapore and Canada. We provide you the best online dissertation topic help in every academic discipline that students ask for.